Great News!!! Stampin' Up has announced extra hostess benefits for parties of $450.00 and higher. 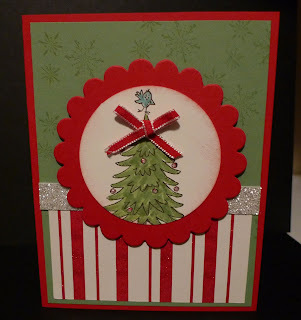 It's a great time to be a hostess and book your own Christmas card making day. This could be one of the cards. The stamp set is called Snow Much Fun and the background was made with Serene Snowflakes. The card stock colors are Real Red, Wild Wasabi & Very Vanilla. Notice the glitter paper? It's called Holly Berry Bouquet Specialty Designer Series Paper. You can find it in the Holiday Mini Catalog. I also used Silver Glimmer Paper. I love this stuff and it's only $5.95. The scallop circle was made with the Scallop Circle # 2 die which works great with the 2-1/2" Circle Punch.